Living with Major Depressive Disorder (MDD) is no easy feat. Take a moment to imagine the sadness you might feel after losing a loved one. This can be the intensity of grief and despair one might experience continuously for weeks, months, and even years when going through a depressive episode. A depressive episode is a period when someone experiences depression symptoms. These episodes can happen once or multiple times in a lifetime. Although social experiences such as childhood trauma, going through a difficult life challenge or losing a loved one can trigger and increase the risk of developing MDD, the illness isn’t always tied to social or environmental events. MDD can occur unexpectedly without a visible trigger or cause. Nearly 1 in 10 Canadians (3.9 million) will suffer from depression at some point during their life1. Depression is the leading cause of disability worldwide, and can impair occupational productivity, physical health and social relationships1. When a person is diagnosed with MDD, there are various treatment options available, including antidepressant medications. The most frequently prescribed first-line antidepressant drugs are called selective serotonin reuptake inhibitors (SSRIs). These drugs can ease symptoms of depression, are relatively safe and typically cause fewer side effects than other types of antidepressants. Cipralex (drug name: escitalopram) is one of the most well-tolerated2. SSRIs selectively increase the availability of a brain chemical called serotonin. Serotonin is involved in mood regulation in the brain and most antidepressant therapies have been shown to increase serotonin activity3. While antidepressant medications such as SSRIs can be beneficial, roughly one in three people with MDD usually do not respond to the first treatment prescribed4. When a person with MDD does not respond to at least two trials of adequate antidepressant treatment, they are said to have treatment-resistant depression (TRD). Fortunately, over the years, effective options have been discovered for the treatment of TRD. One strategy currently being researched is called augmentation antidepressant therapy, which involves adding a medication on top of a prescribed first-line drug. Augmentation antidepressant therapy can be beneficial for patients with MDD or TRD and was developed to make first-line drugs, such as SSRIs, more effective antidepressants. One of the drugs that can be used as an add-on to a SSRI in augmentation antidepressant therapy is Abilify (drug name: aripiprazole). As part of a second generation of drugs primarily used in the treatment of schizophrenia, Abilify is mainly designed to decrease the activity of a brain chemical called dopamine. Dopamine is important for motivation, pleasure and reward. Many research groups are studying augmentation antidepressant therapy. For example, in the CAN-BIND-1 study, Abilify is added to a regimen of Cipralex for individuals who do not respond to Cipralex alone. The researchers of this study aim to determine why some people respond to Cipralex alone, why others respond to a combination of Cipralex and Abilify and why others don’t respond to either the single-drug or combination-drug treatment. Results are expected to be published shortly. A description of the study protocol can be found here. Dr. Pierre Blier is Clinician Scientist, Professor and Chair in Mood Disorders Research at the University of Ottawa Institute of Mental Health Research (IMHR). 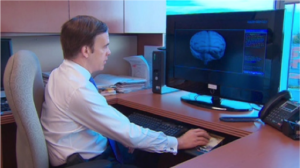 Dr. Blier’s research focuses on augmentation antidepressant therapy for the treatment of MDD. Dr. Pierre Blier (MD, PhD) is an internationally renowned Clinician Scientist who serves as part of the Executive Committee for the CAN-BIND Program. As a Scientist, Dr. Blier has conducted many research projects on the effects of augmentation antidepressant therapy on the activity of several brain chemicals, including serotonin and dopamine. As a Psychiatrist focused on treatment-resistant depression, Dr. Blier views augmentation antidepressant therapy as a beneficial treatment strategy for many of his patients. A recent CAN-BIND preclinical study in Dr. Blier’s research laboratory has shined a light on how the combination of Cipralex and Abilify changes brain activity in rats. According to research conducted by PhD candidate Mohammad Ebrahimzadeh under the supervision of Dr. Mostafa El Mansari in Dr. Blier’s laboratory, this combination of drugs has a synergistic effect on increasing serotonin activity in the rat brain5. In other words, the increase in serotonin activity in response to both Cipralex and Abilify together is more than the sum of the increase caused by each drug on its own. The results of this research might provide an explanation for the clinical effectiveness of combining Cipralex and Abilify. In addition, these evidence-based results may help guide psychiatrists in the process of treatment selection for their patients and may contribute to the development of new effective treatments for TRD. Canadian Network for Mood and Anxiety Treatments (CANMAT) 2016 Clinical Guidelines for the Management of Adults with Major Depressive Disorder: Section 1. Disease Burden and Principles of Care. Lam RW, McIntosh D, Wang J, Enns MW, Kolivakis T, Michalak EE, Sareen J, Song WY, Kennedy SH, MacQueen GM, Milev RV, Parikh SV, Ravindran AV; CANMAT Depression Work Group. Can J Psychiatry. 2016 Sep;61(9):510-23. doi: 10.1177/0706743716659416. Epub 2016 Aug 2. Cipriani, A., Santilli, C., Furukawa, T.A., Signoretti, A., Nakagawa, A., McGuire, H., Churchill, R. and Barbui, C., (2009). Escitalopram versus other antidepressive agents for depression. Cochrane Database Syst Rev, 15, CD006532. Haddjeri, N., Blier, P., de Montigny, C. (1998). Long-term antidepressant treatments result in a tonic activation of forebrain 5-HT1A receptors. J Neurosci 18, 10150–10156. Blier, P., Ebrahimzadeh, M., El Mansari, M. (2017). Effect of Combining Aripiprazole with Escitalopram on Serotonergic and Noradrenergic Neurotransmission in the Rat Hippocampus. Biol Psychiatry 81, S267.